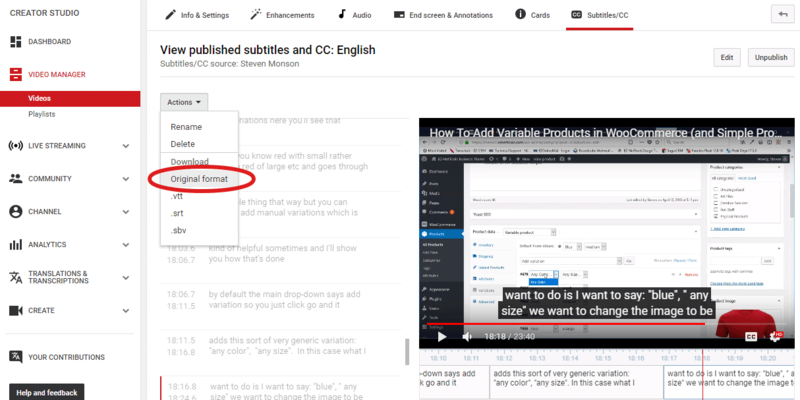 So… you just got done adding closed captions to your YouTube Video. It took a couple hours, but you’ve fixed all the mistakes YouTube’s algorithm made, and make the whole thing nice and easy to read. Nice work! Your video will probably start ranking better in YouTube’s search. 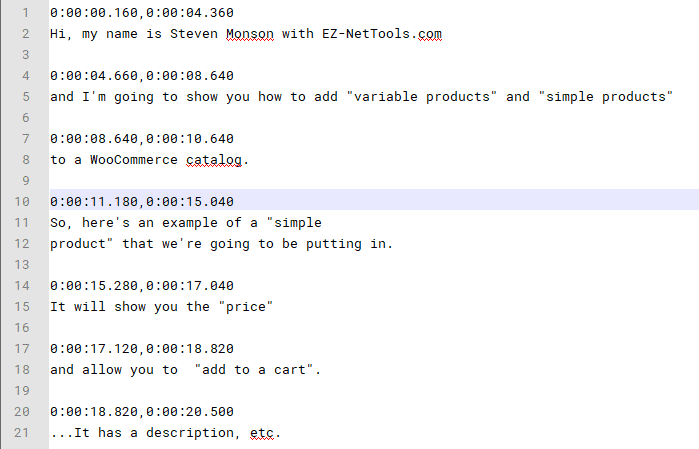 So You Want To Add A Video Transcript? To take further advantage of your labor of love, you decide you want to add a transcript to your website or blog. You download the transcript, and open it in notepad. These timestamps are helpful for YouTube, but not for every situation. Great. Except it’s littered with thousand of timestamps above each line. For a moment, you consider deleting each one, one at a time. Then you decide, hitting your head repeatedly against a wall would probably be more enjoyable (and better for your mental health). So, the other day, I found myself in this situation. I did a few Google searches hoping for a way to download a version without timestamps. Instead, I found forums with various complicated tutorials. One tutorial recommend I install a special program. Import the file. Export that file. Copy it into Google Docs. Install a special add-on. Run it through that program. Download the file again. And put in on my site. Okay, I’d rather not install a bunch of extra software, but I guess that works. I started down that path, but once I downloaded the program, it needed to install java. But java wouldn’t install. I tried again. No dice. Fine. I didn’t want to install java anyway. The first link game me a simple online tool that did exactly what I needed. Admittedly, it’s not going to win any design awards. But it got the job done, and it was fast and easy. I pasted my transcript on the left. Clicked the button. And a cleaned up version appeared on the right. So I decided to write a short article about it. That way, I can easily find the link again in the future, and anyone else who has the same trouble can find it too. P.S. Here’s a link to the video page (with transcript) that was alluded to in this article. OH……MY………GOODNESS!!!!!!!!!!!!!!!!!!!!!!!!!!!!!!!!!!!!!!!!! BRO, you just saved me boatloads of time. I’ve got videos for my college class that I’m getting the transcripts from Youtube. It’s taken me 2 days to work on 2 videos and I’m not done with the 2nd one. I’ve got about 4 more to do, but with this, I now just have to listen to the video and add the correct punctuations. THANKS SO MUCH!!!!! !